Finding new and different things to do with the chicken is always an adventure because you can come across so many great recipes from different cultures around the world that you may never have thought of even trying before. Since I buy a lot of whole chickens and chicken pieces, I always want to try new and interesting ways of cooking chicken that are going to bring new flavors to the table. I found this recipe for ariran guisou, a dish from Honduras that is a chicken stew, on the Saveur website and it had a great mix of spices and flavors and seemed very easy to make, so I knew I had to give it a try. 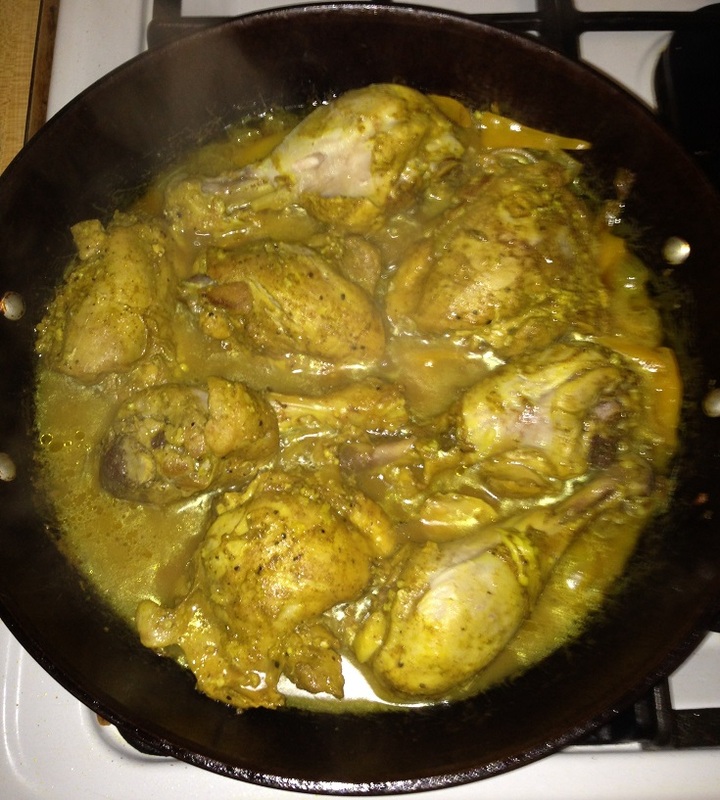 Combine the chicken legs and thighs, the lime juice, Worcestershire sauce, sugar, mustard powder, black pepper, turmeric, cumin, garlic, onion and kosher salt in a large bowl. Mix all of the ingredients well to coat the chicken. Cover the bowl with plastic wrap and let marinate in the refrigerator for at least 1 hour. Heat the vegetable or canola oil in a large skillet set over medium-high heat. Add the chicken pieces and cook, turning the pieces once, until the chicken is browned, about 8 minutes. Transfer the chicken to a plate and set it aside. Add the onions from the marinade and the bell pepper to the skillet. Cook until the onions and peppers are soft, stirring occasionally, about 5 minutes. Add the reserved chicken and any accumulated juices back into the skillet along with the chicken stock. Bring the mixture to a boil and then reduce the heat to medium. Cover the skillet and continue cooking until the chicken is cooked through and the pieces run clear when pricked with a fork, about 15 to 18 minutes. What you end up with is an incredibly flavorful chicken that is tender and tasty. The marinade for the chicken is great and you get the wonderful spiciness of the cumin and the turmeric along with a delightfully sweet flavor as well and the lime juice just adds the right amount of tarn flavor and aroma to the overall dish. We all really liked it and I served this with some white rice and the resulting sauce of the chicken went really well with the rice. Once the chicken is marinated, the whole meal took less than 30 minutes to make so it is a great option for you when you want to try out something new with some chicken pieces.